US companies like Google and Facebook are firmly in the firing line. THE EU HAS unveiled a two-pronged approach to force tech giants to pay more tax in a move that could leave Ireland among the worst-off of any member states. While the measures have been mooted for months, this week’s proposals put shape on the changes that EU officials hope to introduce. The EU has said that it wants to make sure that “digital business activities” are taxed in a “fair and growth-friendly way”. As exemplified by the European Commission’s €13 billion case against Apple and Ireland, officials claim aggressive profit-shifting by multinational tech firms make a mockery of tax rules that weren’t designed for digital businesses. These companies often have little or no presence in a country, unlike more traditional firms or SMEs that require regional operations to handle their trade in each territory. The EU claims that digital firms, on average, pay an effective tax rate of less than 10% on their profits within the bloc, compared to a rate of more than 23% for traditional businesses. The first EU proposal is a comprehensive change to how profits on digital activities are taxed, which the commission said was its “preferred long-term solution”. The change would mean businesses are taxed on the profits they generate in a territory, even if they had no physical presence in the country. The measure would only apply in member states where the firm had either in excess of €7 million in annual revenue, more than 100,000 users or over 3,000 business contracts created in a year. The second proposal is an “interim tax” on digital revenues, rather than profits. The flat 3% tax would only apply to companies of scale, those with global turnover of more than €750 million and taxable revenues of €50 million in the EU. The resulting tax, which would effectively function like another level of VAT, could bring in as much as €5 billion a year, the EU said, with the funds to be distributed to member states based on where the sales originated. The commission said the levy would only be used as a temporary solution to “claw back some revenues” while a more holistic solution was developed and implemented. While the EU has insisted that the proposals don’t discriminate against non-European digital companies, in practice both plans will hit US companies the hardest as there are few indigenous firms that operate at the requisite scale. The interim revenue tax will in practice only apply to large firms, and it is designed to only target services where it is users that generate the value. That means the sale of online advertising, primarily affecting Google and Facebook, and commissions on peer-to-peer transactions, which would cover platforms like Airbnb, Ebay and some Amazon services. Meanwhile, the first proposal is pitched as a step towards a future Common Consolidated Corporate Tax Base – a move vehemently opposed by Ireland as it would largely negate the usefulness of the country’s low corporate tax rate. Both tax proposals would heavily favour large member states – where the majority of customers in the EU are based – at the expense of smaller countries that have used their tax systems as a lure for foreign investment. In this context, it’s unsurprising that France, in particular, Germany, Spain and Italy have backed the measures, while states like Luxembourg, Ireland and the Netherlands are opposed. As previously explained by Fora, Irish officials are worried that the plans would strip the Exchequer of corporate tax revenue as they would reduce the amount of profits declared in the Republic. A Revenue briefing document from last year said Ireland had the most to lose of the larger EU states under the tax plan. While the second proposal of an interim revenue tax would provide a definite hit to the tax take here as it would reduce the scale of profits declared by tech firms in Ireland, the first proposal would likely have a far greater impact. By breaking the link between tech companies paying tax where they declared their profits – often in countries like Ireland where they set up European offices and housed their intellectual property – the lure of a low corporate tax rate will be largely removed. Ireland’s corporate tax take is heavily dependent on just a handful of multinational firms, which have been increasing their payments to the Exchequer in recent years. 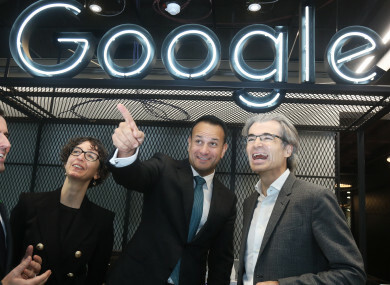 One of Google’s local companies, by way of example, recorded an Irish tax charge of €164 million for 2016, which would have put it among the country’s biggest taxpayers that year. A secondary hit to the company’s finances would come with less foreign investment if the attractiveness of Ireland’s low tax rate was reduced. That would mean fewer jobs created here by multinational tech companies, which would in turn reduce income tax for the State. While Ireland, like all EU states, enjoys a veto on tax matters, it’s unlikely the government will want to act alone in opposition to the tax push. It’s more likely that the State will gather like-minded allies, particularly beneficiaries of the digital economy like Sweden and the Netherlands, to continue pushing for the issue of multinational tax avoidance to be dealt with at a global level. The proposals will go to the European Parliament for consultation and the European Council for adoption, so there is a possibility that they will be watered down – although large member states could still opt to act unilaterally to tax digital revenues. Meanwhile, the OECD has been working on its own proposals to crack down on multinationals’ profit-shifting at a global level. Ireland has backed this process in principle, however progress has been slow and no proposals are expected to be finalised until 2020. Either way, the tech giants are in policymakers’ sights, and Ireland will have to fight not to become collateral damage in that battle. Email “What the EU's new taxes on the tech giants mean - and how they would hurt Ireland”. Feedback on “What the EU's new taxes on the tech giants mean - and how they would hurt Ireland”.